Everything Must Go: One-of-a-Kind, Unique, Pre-owned, & Estate Jewelry. 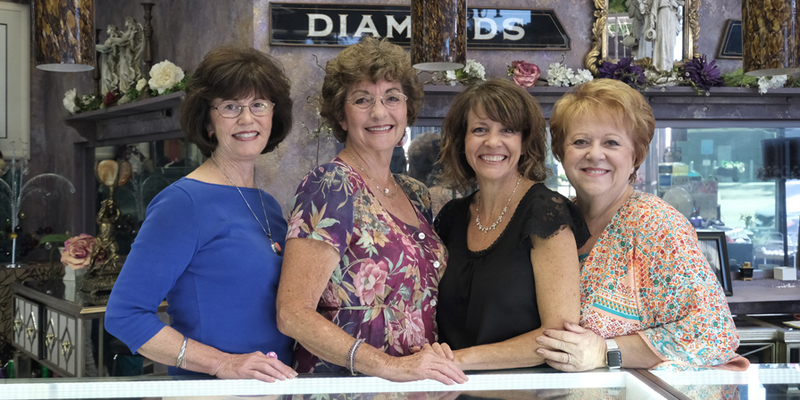 For the past 37 years, Rhonda, of Rhonda’s Jewelry, has built a reputation on quality, service, expertise, and trustworthiness. They provide top quality jewelry selections to accommodate all tastes and budgets. Rhonda’s Jewelry has been in the same location, serving Riverside, even knowing many clients by name. Sadly for Riverside, Rhonda has decided the time has come to retire. This space was originally a diner attached to the old De Anza Theater in downtown Riverside. It is all windows, facing the street where you might have sat at the counter and eaten pie and coffee after your movie date. The feelings in this space have changed very little since then. It still has a soundtrack of Sinatra and charm of days gone by. Their services are personal and genuine. Yes, they sell jewelry; but, not just new to-be-financed wedding sets, but also vintage and estate pieces of unsurpassed quality. There are beautiful costume pieces as well as fine jewelry – something to fit all price ranges and tastes. Rhonda see’s to every detail. Rhonda recently made the announcement that she will be closing this iconic store and service to Riverside this year. It is not too late for you to experience a true taste of living Riverside antiquity. This is the sale to end all going out of business sales. Do not miss meeting this unique community maven and experience this bit of history. There is still time to go and shop the final sales, and have something repaired or re-worked. Or, maybe just stop in and just say thank you for serving as the example to us as what real service looks like. Join Us! Parking Lot Sale Saturday, September 22nd & 29th.